CLEVELAND — Students from dental, medical and nursing schools at Case Western Reserve University will have a new place to call home in the spring. On Thursday, Case Western Reserve University and the Cleveland Clinic unveiled the Sheila and Eric Samson Pavilion , a new space and part of the Health Education Campus where the hospital and the university can enhance collaborative efforts for students such as shared courses and health programs. 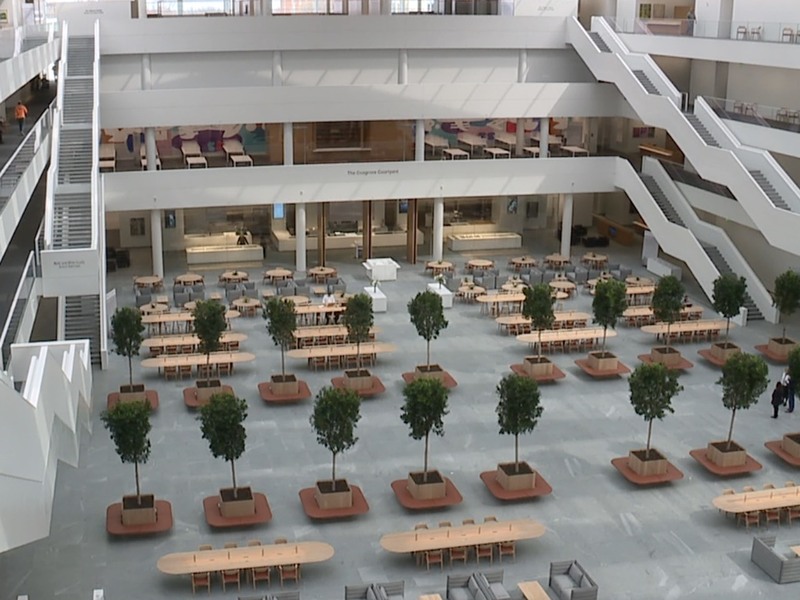 This spring, the four-story, 477,000-square-foot building opens to 2,200 students from Case Western Reserve's dental, nursing and medical schools, including students from the Cleveland Clinic Lerner College of Medicine. Students from the university's social work school will also come to the pavilion for shared coursework. Designed by London architects Foster + Partners, one of the most striking features of the Samson Pavilion is the 80-foot high, 27,000-square-foot central courtyard newly named the Delos M. Cosgrove Courtyard. The Samson Pavilion encourages interaction by having each of the building's walls surrounded with open walkways and a wide staircase at every corner. Students can relax and study at a shared space on the first floor. The Sheila and Eric Samson Pavilion. Photo: Bob Fenner. The pavilion will also feature cutting-edge technology such as two distinct digital anatomy programs, one using mixed reality and the other virtual, simulation programs for flight nursing and ultrasound training, and a large LED wireless touch screen in the classrooms, which would allow students to participate in video conferences from around the world. Across the street from the Samson Pavilion is the second building of the Health Education Campus, a three-story dental clinic, which would designate a separate space for a dental facility, as the university's existing clinic is half the size and it's location is hard to find within a collection of taller buildings. The current clinic welcomes about 19,000 patients a year, with about 60 percent of them Cleveland residents. The new space enjoys frontage on the well-traveled Chester Avenue, with ample parking and drop-off areas for patients. According to the news release, to date, the two institutions have raised nearly $275 million for the $515 million project, and active joint fundraising continues.